To say American whiskey is growing in popularity is an understatement. Over-production and glut of prior decades has been replaced with a seemingly unquenchable thirst for good bourbon and rye (and even quite a bit of well-marketed mediocre whiskey). But there’s a catch: One of the key ingredients to good rye or bourbon is age in the barrel, and with the bourbon boom there are limited sources of well-aged whiskey. Even if you can find some aged product (or more likely procured some a few years ago when it was a little easier to come by) what you are buying is likely from the same source as what is already being sold in a different bottle with a different label. Case in point is the Indiana distillery that uses the same 95% rye recipe to supply straight rye for Redemption, Angel’s Envy, Templeton, Bulleit, Dickel, Old Scout, High West, and others. To that list you can add Willett, although the company did start distilling its own bourbon and rye recently (but so far only a two-year rye has been deemed ready for the market). So how does a company differentiate itself in this increasingly crowded market? Picking and identifying exceptional barrels is one way Willett built its reputation. 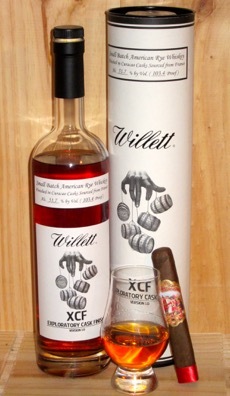 Another way is with unique barrel finishes, which is what Willett is trying with it’s Exploratory Cask Finish (XCF). These days one of my favorite rye whiskeys is the unique and bold Angel’s Envy Rye, finished in rum casks. It’s an interesting twist on the classic rye flavors, with sweetness and tropical spice layered over the distinctive Indiana rye flavors. That’s why I was eager to try Willett’s XCF version 1.0, which starts with an 8-year-old Indiana rye that’s finished in casks used to make Grand Marnier, although (presumably for trademark reasons) it simply refers to as orange curacao. The result is a deep gold color rye that has been cut down to 103.4-proof. The distinctive nose features orange peel, pickle brine, and floral spice. It’s an interesting combination that starts off intensely unique, even a bit bracing, but very quickly becomes deliciously familiar. It pairs perfectly with a woody, full-bodied Nicaraguan cigar like the RoMaCraft Aquitaine Mode 5 or La Antiguadad. The only thing that would make me hesitate to recommend the Willett XCF is the price, which runs around $150, if you can find it. (I only procured a bottle because a friend happened to be near the distillery on the day it was released for sale.) That’s pretty steep, even in this overheated market. But if you enjoy Angel’s Envy Rye and want to taste an even more extreme example of cask finishing then XCF is well worth trying.